The SUHD TV is truly a game changer in the landscape of television as pointed out in What Does TV Mean to You and the Samsung SUHD Revolution. Television with such high picture quality and energy efficiency did not exist in the past incarnation of Television sets. But the past decade have seen rapid developements that have culminated in Samsung’s proprietary, eco-friendly nano-crystal semiconductors called Quantum dots as described in Samsung’s SUHD Smart TV running Tizen OS as UHD Alliance Grows and Internet of Things Beckons. This ability means that highly efficient transmission of colours and light is possible simply by varying the size of a quantum dot, instead of using colour combination and colour filtering as in older LCD LED and Plasma Technologies. The result in a range of colours in the million, many of which your eyes cannot see but make your television experience look even more realistic. Samsung’s SUHD TV image is two and a half times brighter than conventional TVs. Samsung’s SUHD TV has 64 times more color expression than conventional TVs, as well as twice the level of color adjustment points, and a wider range of more accurate colors. Samsung’s SUHD TV advanced all aspects of the TV and revolutionized the panel, platform, picture quality engine, and overall algorithm. It surpasses previous display technology, which evolved from CRT-PDP-LCD/LED and encompasses the advantages of LED, PDP, and OLED TV while improving on their flaws. Samsung’s SUHD technology can take any sourced content in HD or Full HD then convert it to SUHD quality. Samsung’s SUHD TV has a high-dynamic range and wider color gamut: The SUHD re-mastering engine utilizes a sophisticated color grading for the SUHD TV’s 10-bit panel. After introducing the curved form in 2013, Samsung wanted to elevate its design to a level of art. For example, its Chamfer bezel design not only adds more depth to the TV screen, but also makes the TV look like a piece of art when mounted on the wall. The back features a soft, textured Shirring design for a consistent stylish edge from any angle. 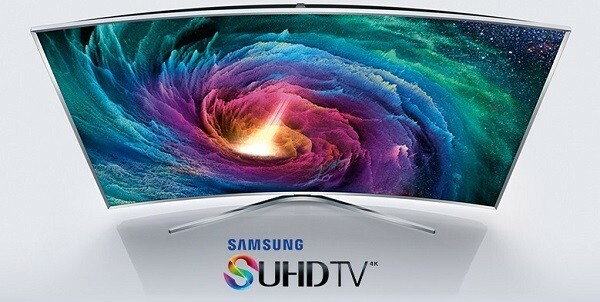 We’ve seen Samsung creating new categories in TV with its LED TV, Smart TV, and Curved TV. SUHD TV will become an entirely new TV category. The hardware, software, content and the overall ecosystem of it is nothing like we’ve ever seen and it is here to change the game. That is one of the reason it has the Samsung “S” badge, which is only reserved for flagship products. New for 2015, all of Samsung’s Smart TVs, including the new SUHD TV, will be powered by Tizen, an open-source platform that supports the web standard for TV app development. Since it’s a Smart TV that runs on Tizen, which aims to be an ecosystem of all ‘things’, the Samsung’s SUHD TV can be the control center of any Smart Home. The SUHD TV will be compatible with Samsung Sports Live, which allows users to watch live games while simultaneously checking team and player stats on the same screen. With its state of the art picture quality, sports fans will love watching games on the SUHD TV. Samsung has also partnered with global games companies for a large and varied games catalogue. That wasn’t so hard, was it? With those ten pointers to consider, you’ll definately be making a great decision this Christmas to bring home a Samsung’s SUHD TV!